The architecture of the Maya was extraordinarily impressive in terms of size, design, and external decoration. It becomes even more amazing when we realize that they did not have metal tools, the wheel, or pack animals. Mayan architects used a variety of methods to enhance the beauty of their buildings. Almost always they elevated temples and palaces by building them on top of pyramids, platforms, and acropolises. Great effort was made to ornately decorated the facades of their public buildings. Buildings were adorned with sculptures and huge stylized masks. In contrast, the insides of the buildings were very plain. Cities were not laid out with formalized plans. However, they have many of the same characteristics. They all had open courtyards, terraced pyramids, palaces, shrines, sweat baths, and ball courts. 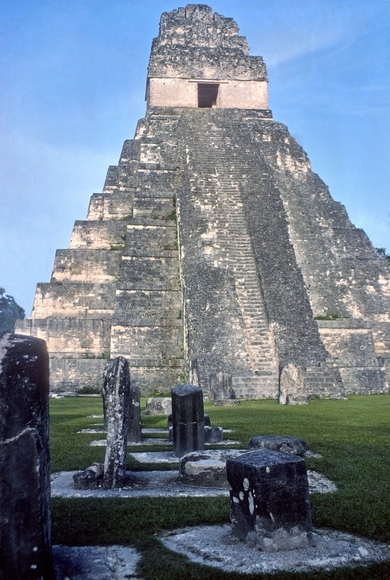 However, architectural styles of the Maya are not all uniform. Most of the Mayan territory sits on calcified rock called limestone. Limestone was the construction material that made it possible for the Maya to build such impressive buildings. It is not known exactly how long ago the Mayans discovered lime, but it is believed to have been sometime around the time of the birth of Christ. Probably, it was discovered by accident. After a long campfire, someone mixed the lime with white dirt and water. The result was the discovery of mortar, cement, and stucco. The Mayan people today produce their lime in very much the same way. The problem is that it takes an enormous amount of firewood to make a small amount of lime. Uxmal, on the Yucatan Peninsula, probably represents the finest example of Mayan architecture. Its educational center is called the “Nunnery Quadrangle” and it is truly magnificent. This was the ancient Mayan version of a modern university. One of the most important architectural styles is the Peten Style. It is found primarily in Guatemala, and it is characterized by steep pyramids and false facades that add additional ornamentation to the fronts of the buildings. Both the Rio Bec Style and the Chenes Style featured entrances that represented enormous serpents mouths. Snakes, especially rattlesnakes are featured throughout the Mayan areas. The Mayans believed that the serpent was the symbol of life and fertility. They also believed that the most fertile lands were the ones where the rattlesnakes lived. When the Toltec arrived in the Yucatan, the serpents were carved and painted with plumes on them. This was in honor of the Toltec god Quetzalcoatl. The Maya-Toltec Style is easily recognized with its colonnades, and ball courts which look very similar to the Mexican high plains architecture. Also, of interest are the reclining idols called Chacmool. Many of the names for the pyramids and temples were named by the archaeologist that restored them. Others were named by the Spaniards when they first arrived. El Caracol is in Chichen Itza. It displays both classic Maya and Toltec architectural characteristics.